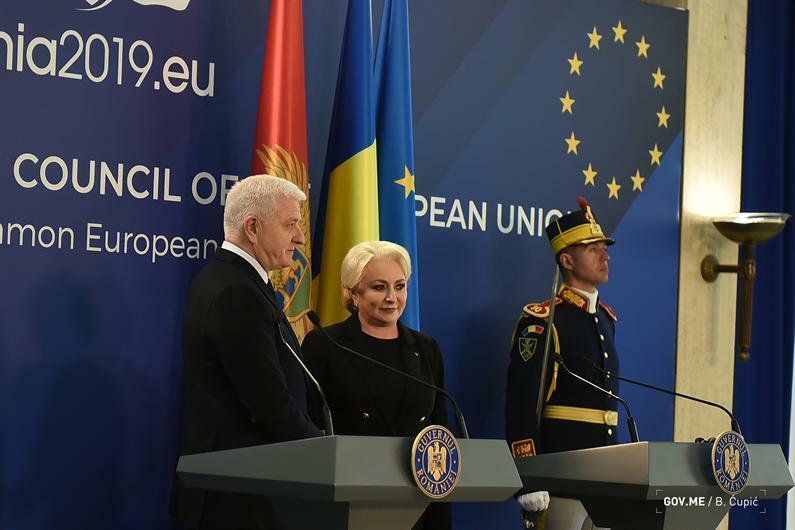 Montenegrin and Romanian prime ministers, Duško Marković and Vasilica Viorica Dăncilă, agreed in Bucharest that the two countries have established friendly relations and partnership in NATO. They also concluded that both aim to deepen economic cooperation, and that the successful completion of European accession of Montenegro, and the continuation of European integration of other Western Balkan countries, is the best framework for the stability of this part of Europe. “We talked about the development of bilateral relations, successful cooperation within NATO, as well as the potential for strengthening our relations. Montenegro, as a NATO member, a country in far-reaching negotiations with the European Union and among the highest rates of economic growth in Europe, wants partners from the EU and NATO with whom it can develop a successful economic cooperation”, Marković told a press conference following the official talks. Prime Minister Dăncilă stressed that Montenegro is a country that can set an example to others in the region, adding that Romania gives priority to the Western Balkans. She underlined that the official Bucharest’s policy is to evaluate each state on individual merits. The Montenegro Government official announcement reads that Prime Minister of Montenegro thanked his host for the support, noting that the country fully understands and supports Romania’s efforts to fulfill the priorities of the presidency of the Council of the European Union in a very complex environment. “Our ambitions are clear, our goal is to open the last negotiating chapter, Chapter 8 – Competition, and create the conditions for closing the chapter. We are encouraged by the support of Romania and the open and constructive talks we have had. We are focused on our obligations and we are not burdened with the developments within the Union, we do not base our plans and goals on this, and we make it clear to our partners. For us, Romania is not only a friend but also a partner who can, with its experience, help Montenegro achieve a strategic commitment of EU membership. We also appreciate Romania’s understanding of the region of the Western Balkans and the significance of its European perspective”, Marković said. Dăncilă underscored that Romania fully supports the ambitions of Montenegro in the EU integration process, including the plan to open the only remaining negotiating chapter. The meeting of Prime Minister Duško Marković and President of Romania Klaus Werner Iohannis focused on the European integration of Montenegro.